I know that this is no record, but I think the result is worth posting. So I have done a lightweight frame with 12mm carbon tubes of about 700mm <100gr. This allows to go from some long flight times, since big props are possible, and the frame is rigid enough to mount some serios motors. 12mm carbon tubes (1mm thichness) base frame (no standard centerplates, just build a cross and stiffened it up with CF and small CF pieces. Here a video with more conventional batteries and 18x5 props (which are a bit less effective than the 17x5,5. if you have some endurance results be welcome to post them here. As this is not a secret thread, it would be great also to get the details of the copter and the battery. Last edited by EndOfDays; Jan 16, 2014 at 08:13 AM. What's the catch? I've don't know anything about LiIon. I'm guessing discharge rates are really low? But with that size, you don't need a really high C rating. that is quite amazing ! can you please post photos of your frame ? The panasonic are 3400mAh nominal, and rated 2C max discharge. In other words, for a copter that is not flying more than 45min with standard batteries, it is not a good choice. The voltage (available) during flight is about 1-1.5 Volt lower than with a Lipo. They can be used until 2,5V a cell (under load), but the voltage drop at the end of the capacity is very sharp, it was less than a minute from 2,75V down to 2,5V. I also had to change the ESC to NiMh mode, since my first flight was aborted by the escs stopping at 3,15V a cell. If you compare to a Lipo you should compare to the maxamps, as the have the best performance for this application, and the panasonic give about 10%more. Any reason why you went with 4S instead of say, 6S? Higher voltage, lower the kV of the motors. More efficient? Either way, very impressive. When's the FPV date scheduled for? What I would need are four (good - handmade) motors with 250-300kv with around 40-60gr, with them I could come close to 2h flight time then. The rctimer motors are ok, but they are not as good (efficient) as the hobbyking NX4006 with 530KV for example. End Of Days, thanks for sharing your fantastic flight duration! My quad is just airborne for some 13 minutes, I am working on improvements. To achieve this long flight time, I think good balancing is important, so all battery power can be used for thrust. I shall now read your blog. excellent and congratulations .. for low kv motors how will you find the propellers ? i mean definitely it will require atleast 20-22" prop .. where can you get that ? Do you have any idea why they provide 'only' ( not meaning to downplay this great performance ) the 10% extra power compared to the 20% you would expect based on their specs ~ 0.20 Watts per gram vs ~ 0.25 Watts per gram). Did you notice either one of them being overrated or underrated? Also what were the more conventional batteries used for the 73 minutes flight? If you want a light camera you could get an 808 #16 keycam. They are only 18 grams. The video is not as good as the gopro but it is really good for the weight. 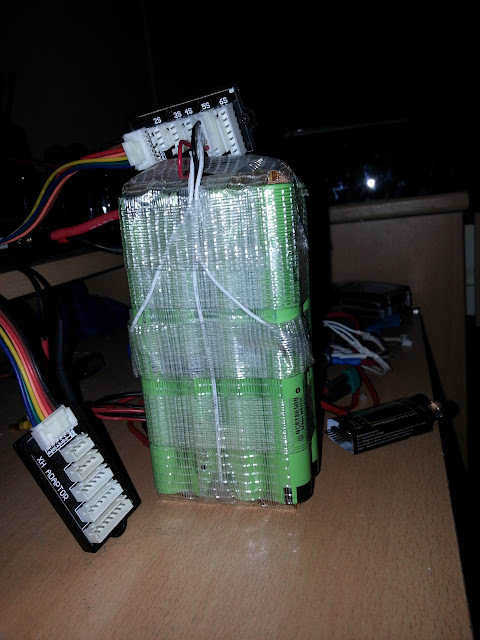 For normal use I would stop at 14.00 Volt under load with a 4S LiPo. If you "know" your battery is ok, and the cells are matched you can go down to 13.00 Volt (but you will not gain a lot with this). For LiIon you can go down to 11V under load, if everything is perfect (e.g. you go for a record) also 10V is possible (but again, this is only 1-2 min (from 11 to 10 Volt at the flight of 87 min). If you use a LiPo, and it should last some more cycles, stop at 14V. If you look for propeller you have to look around in the "standard" FPV/Copter online-shops (rctimer.com, foxtechfpv.com, ...) If you can make propellers yourself, you are the King. I am going for a flight with camera and Video-downlink within the next weeks, if the result is reasonable I will for sure post it. Up to now, the "payload" is 115 gr, which is Horizon HD, iftrontech stinger, CL Antenna, EzTiny, and some sort of mounting underneath the copter.